I am sure you have picked up on the fact my family is not, shall we say, boring or like most others. Most families can sit around have conversation or watch TV without much excitement. 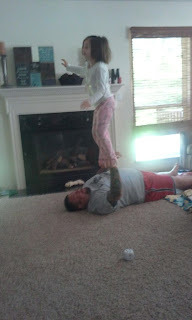 Well, in our house we are always coming up with silly human tricks to pass the time. Here is Marli practicing her balance for a possible future as a circus performer. This is the picture of the day.